Maria Artuso MBA(FS) 2015, Director, Business Enablement and Performance, RBC Insurance Services Inc. at RBC Insurance, was recently awarded the 2019 Global Citizen in partnership with RBC and the WE Organization. 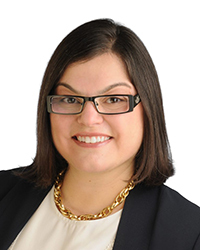 Maria is also a past recipient of Ottawa’s Top 40 under 40 business professionals (2016). Maria is dedicated to giving back to her community, believing that her volunteerism enhances her job performance and life experiences. She graciously shared her thoughts and insights on the topics of giving back to community and what it means to her. What are your most memorable experiences in the role of a volunteer and mentor? Volunteering and supporting financial literacy have been some of the most personally rewarding activities I have ever done, and I can’t believe it’s been over 15 years now. The experiences have allowed me to stay relevant, agile, and self-reflect on the changing needs and times of our future: the children of tomorrow. There is no greater self-pride and motivation to keep giving back in this manner than when I am able to provide a student with the inspiration to do and be whatever they set their mind to, and connect with them in a way that allows them to open their minds and dig deep into their own self and knowledge. Each student is so unique in their own way – some shoot for the stars, some are brilliant and creative thinkers, and some are really focused on getting through today – there is much to be learned from everyone. What advice would you give someone who is considering getting involved with community volunteering? If you are thinking about volunteering in your community, pick an organization that you feel very strongly and passionate about, and don’t wait – do it now and give it your all. Know yourself, and then be true to yourself. Know what you love doing and what motivates you. Build your personal brand. What do you want people to say about you? You need to be ready to “tell your story”. Push yourself outside your comfort zone. Believe in yourself and your capabilities. Try new roles, new projects, and always put up your hand to try new things. How do you feel your academic, personal and professional goals are connected? I see personal and academic goals as the basis to my professional goals. My strong family network and upbringing really made me who I am today – I sweat all the small things, everything is important, family is everything, and I try to make as many things happen as possible to avoid ever having regrets. I love being busy, accomplishing lots, and ticking off personal lists of accomplishments – that makes me feel as though I’ve contributed to the greater good of our society and well-being of others. Professional growth and goals exist as a result of curiosity, thirst for knowledge, and the personal goal of always learning, and being better at what I do. I am my own competition. What is my next journey? Time management skills and working at a higher capacity are a legacy of my years with Dalhousie and certainly a foundation for what I am proud of today. I went on to achieve the Fellowship of CSI and am seriously contemplating starting my PhD over the next couple of years. Higher education stretches us and creates a strategic mindset that influences our thought processes and reasoning abilities. I now approach scenarios thoughtfully with an interdisciplinary perspective, open to a variety of biases and filtering information to come up with the most comparable results and outcomes. I appreciated Dalhousie’s open and respectful environment that generated meaningful discussions. I am proud to have leveraged the outcomes of my MBA(FS) years in my day-to-day professional career.